I've got a few theories on self defense. Theory #1: no matter your skill level or equipment, there will always be scenarios you'll be victorious, and those where you'll be defeated. Can a 90 year old Grandma defeat a Special Force operator? Sure, if Grandma is armed and our Special Forces operator is fall-over-drunk. It can happen. The best you can do, therefore, is to incrementally move scenarios from the defeated to the victorious column (In this case: don't piss of grandma and don't get fall over drunk). You won't move them all, but every little bit potentially helps. After all, which hypothetical scenarios you'll actually encounter is anyone's guess. Theory #2: with the exception of firearms, self defense tools (weapons?) that a civilian carries are not intended to take take down an attacker. Sure, you might get lucky and that the pepper spray or whistle scares off a bad guy, but there's no guarantee. The best you can hope for is that these tools allow you to make space to either fight or run (spoiler alert: I'm running). In most cases, they buy you just a moment. Of course, that moment may be exactly what you need. Theory #3: every self defense implement has pros and cons. Take pepper spray. Pros: it's less-leathal (which is great if you spray the 12 year old living next door; or the cop who you thought was breaking into your house), relatively cheap and gives you important stand off distance. Cons: relatively hard to train with, influenced by the wind, will be hard to deploy in a stressful situation, makes a mess if you have a misfire in your purse or pocket. That sort of thing. That doesn't mean you shouldn't grab that can of pepper spray when you take a jog, just know its limitations and work around them as best as possible. Given all of this, my self defense tool of choice is the poorly named, tactical pen. A tactical pen is a take on the kubotan, which is just a glorified stick you can use to make your hitting more effective. Pros: you can bring this device anywhere; relatively easy to train with; dual purpose, so you'll actually use it; no accidental misfires; doesn't run out of batteries or spray. Cons: has no stand off distance; requires that you fight back; requires training to be effective. I can imagine it moving a couple of scenarios from the loss to the win column, so that's good enough for me. Oh, and I like carrying pens on me, so that's a big win. For about 5 years(!! ), I carried and liked the Schrade Tactical Pen. 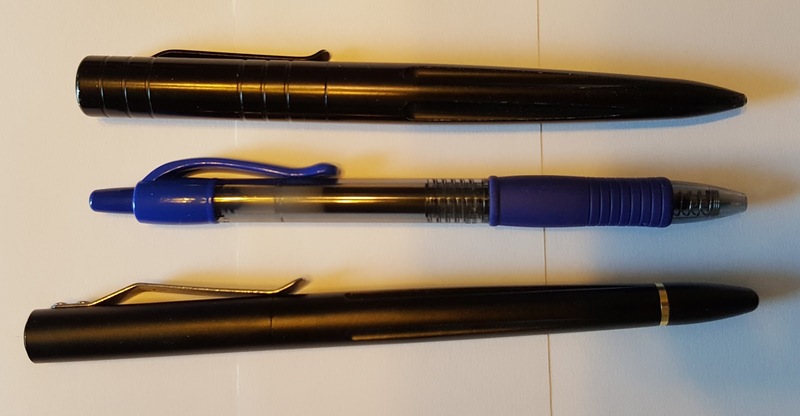 Unlike some pens out there, it didn't have a weapon look to it. It just looked like a big, black, durable pen. Which it was. I didn't love that it was branded as a Schrade, which screams "hey, this is a weapon!" to security guards everywhere. And I also didn't love how the pen wrote, though I think I just never took the time to replace the ink cartridge with gel ink that I prefer. All in all, the Schrade was just about perfect for me: a solid pen, and a solid self defense tool. But who wants a tool that's just about anything, right? The Cen-Tac Slim Line is a very attractive slender barrel style tactical pen that looks more pen than tactical. For $10.00 and free shipping I decided I'd give the pen a try. So far, I'm glad I did. As promised, the pen is slender and doesn't scream weapon. Plus, it's labeled LAIX-Q1, which is far better branding than say, having Smith and Wesson stamped on your pen. The photos really don't do the Cen-Tac justice. It's far slimmer than the Schrade and longer, too. It still fits in the front pocket of my jeans without a problem. I also like the quality of ink it comes with out of the box. Again, you can barely tell from the photo, but the black ink is definitely darker than the Schrade. For most writing tasks I still grab the G2, but the Cen-Tac definitely strikes me as more pen friendly than the Schrade. For now, the Cen-Tac Slim Line will be my go to self defense pen. It's more pen-like than the Schrade, but just as durable should I ever need to get all pokey-poke with it. And for $10, you can hardly go wrong. By the way, if you don't the Cen-Tek available on eBay, just drop a line to barracudastunguns on eBay and he'll hook you up. 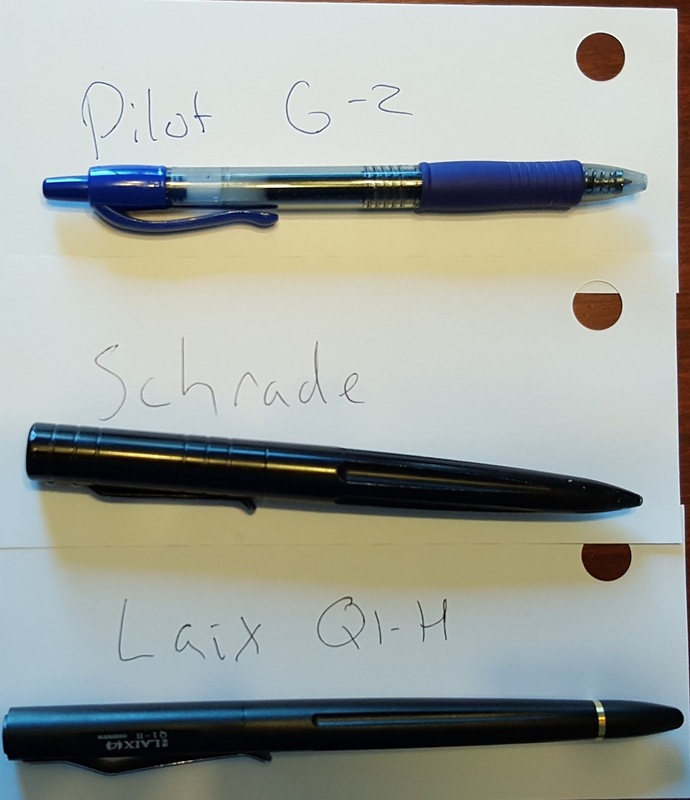 Where do we get training how to use these pens? In my experience, Krav-Maga will teach you the core principles you'd need to know to be effective with a defense pen. Barring that, any self defense class would be a good start. Once you get down how to deal with a self defense situation without having any assistance, something like a pen (which is basically a blunt force weapon) is just bonus.. But don't take my word for it :-). Seriously, give Krav Maga or a self defense class a try - I think it's a worthy endeavor, *especially* if you consider yourself the last person in the world to be interested in that kind of 'thing'. Push yourself out of your comfort zone, it'll be worth it.